Structural changes in higher education system in recent years challenges traditional roles (teaching, research, and service) of an academic profession and its career path. In order to investigate changing academic profession and its possible future direction, it is necessary to ask different questions from more diversified perspectives (Rhoades 2007). This study aims at suggesting a framework to understand changing academic profession by analyzing studies using academic identity as the key concept in overseas and by carrying out investigation in Japan. 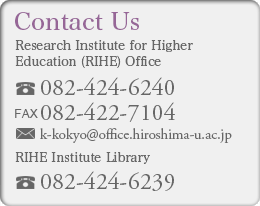 In Japan, researchers from Hiroshima University have led studies on academic profession by using educational sociological approach (Shimbori 1965, Yamanoi 1990, RIHE, ed. 1995, 2005, Arimoto, eds. 2008). Those studies successfully captured characteristics of Japanese academic profession compared with other countries, however, some criticize that their approach ignores career stages of the profession and diversifying academic posts such as a fixed term position, a position attached to a project, and a third space position (Tateishi 2014, Hata 2013). There is an urgent need to redefine the academic profession, analyze the impact of lived experiences on the career formation, and suggest a new framework to investigate the changing academic profession. Meanwhile, there are attempts to understand the lived experience of changing academic profession in English literature with a focus on academic identity by applying qualitative methods such as life story interviews and ethnography (Henkel 2000, Barnett and Napoli 2008). However, in these studies, although academic identity is described as something that academics commonly share, there has not been agreed conceptual framework on academic identity and it is not clear how we can accumulate these studies to further develop academic profession research (Clarke 2013). Therefore, this study aims to answer following research questions. What do researchers ask when they focus on academic identity? What are their research questions, methods, and discussions? From those studies, how can we define academic identity? What would be equivalent concepts to academic identity in Japanese? What are the outcomes of studies that use such concepts? Would those studies fill the gap between educational sociological studies on academic profession and diversifying lived experiences? Based on (1) and (2), what would be a framework to understand changing academic profession and its future direction?